Small notebook. Big performance. In a class all of its own. Knock out assignments with this small, yet powerful notebook. Packed with amazing battery life and Windows 8, the affordable price may surprise you. With an eye-catching modern design, you'll enjoy carrying your HP 3125 to classes and meetings. With a starting weight of just 3.52 lb, this ultraportable notebook helps you stay on top of your game. No heavy computer bag or backpack required. Enjoy up to 9 hours of battery life. Unlike other highly mobile devices, the HP 3125 has a replaceable battery so you can easily swap it out and get back to work. Don't squint. Clearly see your documents, presentations and web pages on the 11.6-inch diagonal HD display. Plus, comfortably type on the 97 percent full-size keyboard without adding bulk to your PC. On the move? Your data stays protected from accidental bumps and bruises. HP ProtectSmart senses when your PC moves and locks your hard drive to help protect your data on your HP notebook. The HP 3125 has a durable design so when you're on the go, your PC can keep up with the rigors of mobile use. The HP 3125 is optimized for Windows 8, giving students and staff a familiar PC experience. Plus, conveniently use the touchpad with multi-touch gesture support to navigate your screen. Rely on the latest AMD processor and chipset to power through assignments and tough deadlines. Add polish to your presentations with impressive AMD Radeon HD Graphics performance. Connect with students worldwide with the HP TrueVision HD webcam. Thanks to built-in Beats Audio and dual speakers, the HP 3125 is designed for the best sounding, richest audio available on a PC. Small size. Big sound. With WLAN wireless solutions, be confident that you're online when you need to be without tying you down to cords. Present ideas easily by connecting to displays and projectors through the included VGA and HDMI ports. Listen to music or webcasts using the headphone jack. Plug in your favorite peripherals - from printers to smart phones -using the USB ports. HP is committed to protecting the environment. The HP 3125 incorporates select materials and features configurations that help reduce the impact on the environment. 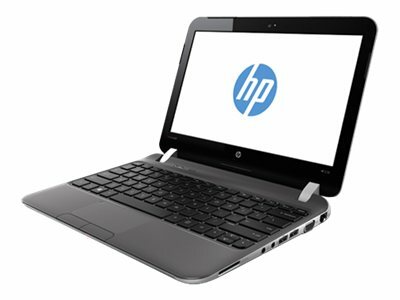 The HP 3125 notebook PC is EPEAT Silver registered in the U.S. and ENERGY STAR qualified.